According to Google, future iterations will incorporate Google’s Weave platform, Google Cloud Platform*, over-the-air updates from Google and the Google IoT Developer Console. Deploying Android Things on Intel® architecture combines the power of Android with the performance of Intel architecture to scale IoT projects from proof-of-concept to product reality. Because the firmware is Android-based, developers benefit from working with familiar Android frameworks, languages and tools. Access to Google Play services and over-the-air security updates further simplify and accelerate development and increase security, allowing developers to focus on creating products and the user experience. Google used the Intel Edison system-on-module (SOM) as a reference device for further development of Android Things. With the launch of Android Things, we added Android Things support for Intel Edison on different expansion boards such as the Intel Edison Kit with Breakout Board and the SparkFun blocks for Intel Edison. Support for the Intel® Joule™ Compute Module is coming soon. Intel Edison for Android Things is a compute module that works with a variety of expansion boards, which can be tailored to different application domains. The Intel Edison Breakout Board is a small form factor board that’s just slightly larger than the module itself and provides a minimal set of features and easy access to the GPIO. The Intel Edison Kit for Arduino includes a larger expansion board that allows the Intel Edison module to interface and access the open source Arduino shields, libraries and resources. The module can also be used with the SparkFun’s Blocks series for further customization. These expansion options enable quick adoption, ease of use, and are well suited for developers interested in quick prototyping and making fast time-to-market IoT solutions. The Intel Joule compute module is an advanced, high performance technology that offers high-end computing, large memory and 4K video capture and display. 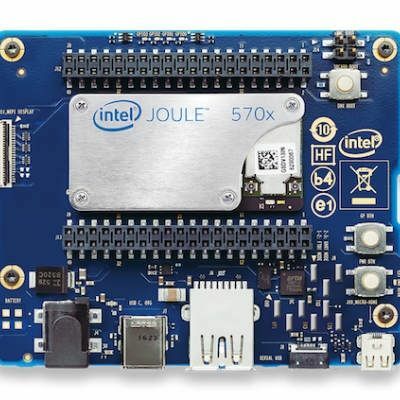 Once validated, developers will be able to use the Intel Joule platform to build out an embedded system or prototype in the areas of robotics, drones, industrial machine vision, augmented reality and more. What is the latest Android version available in the market?